Using search tab you can search for a particular SKU or recipe to view their variances. Search tab make it easier to find the items. In the above example, the variances for SKUs "milk" tagged as "Dairy" are displayed. Case 1: You can select the date range from dropdown and click Generate to generate the report for the selected date range, the generated report can be exported using Export button. Case 2: You can use dropdowns and search tab to export a report for selected options. 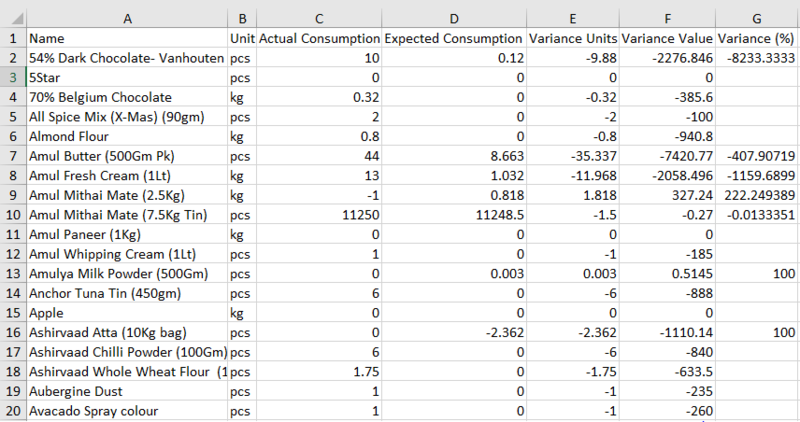 As you can see in the above example, a variance report for both raw and finished goods is generated.